1.Click here to go to Ola Cabs. 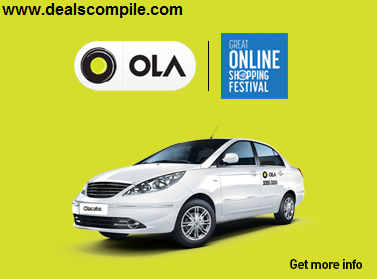 2.Get Rs.598 Ola Money for Rs.299 only! Recharge today! 3.Offer valid only on Dec 10th, 11th and 12th!. -Offer available only when you recharge Ola Money. -Offer is Valid on 10th Dec, 11th Dec & 12th Dec.
-Offer can be used only once per account in the period. -Ola Money can not be used on Kaali-peeli rides and auto rides. -Offer is applicable only on Ola Money recharges between 10 Dec 2014 and 12 Dec 2014. -Olacabs reserves the right to change the offer terms and conditions any time at its sole discretion.